What is the standard? It is the description of the ideal animal of some particular breed. The detail description of an animal is given including its type, bones pattern, form of head, eyes and ears, colours, etc. All these features are measured by the particular scale of scores. 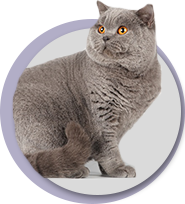 British Shorthair cats are compact, stout animals with harmonious body constitution. The body – from medium to stout, muscular with wide well-developed chest. Extremities – short, massive, rounded. Pads – rounded, strong. The tail – short and thick with rounded end. The head – rounded and massive. Its’ roundness is emphasized by well-developed cheekbones and mandible. The neck – short, strong and massive. Eyes – large, round, widely opened. The colour of the eyes depends on the colour of the fur. 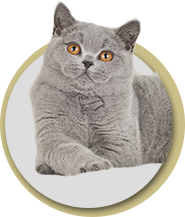 It is said that the eyes of the British cats are the mirror of this breed. The nose – short and wide, straight (passage from forehead to nose must be visible but not of “Persian” type). Ears – short and wide at the basis, round and widely “implanted”. 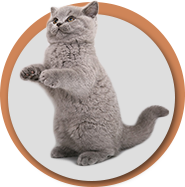 The fur – short, thick and resilient, not adherent with abundant underfur. Give him a stroke! It is a “teddy-bear”!